No matter what you are driving our specialist vehicles and environments courses train you to drive it - we have run 4x4 courses for professional fleet drivers in Mongolia, trained amphibious ATV drivers in Russia, snow and ice driving in Kazakhstan and trailer users in Surrey! We can provided bespoke specialist vehciels and environments training for the challenges you will encounter during a big overland adventure, or specific place of work, from the arctic snows of Norway through the sand dune deserts of North Africa, to the jungles of Indonesia and high mountains of Asia. Our team of trainers have a vast experience of driving and travel across the globe with a variety of different vehicles. The course is built to your exact requirements, covering all essential safety checks and driving techniques for the terrain and vehicle you will be driving. 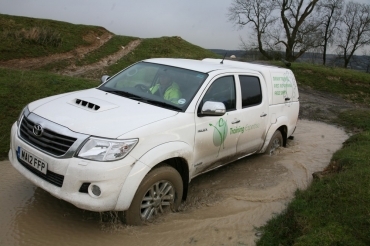 We even have courses to help you solve those little problems when the vehicles dont want to play and you just need to make it to the next point of civilisation! We can advise on vehicle and equipment selection prior to going, what works best in any location. Get in touch to tell us about your plans and how we may be able to help. The training was so well tailored to our needs, with a range of drivers, vehicles and in a remote location this was essential.